PracticeLink.com S UMMER 2018 21 CORNERSTONE FAMILY HEALTHCARE, a non-profit community health center, has strived for 50 years to remain the cornerstone of healthcare where we serve. This goal has pushed us to expand into communities in need. 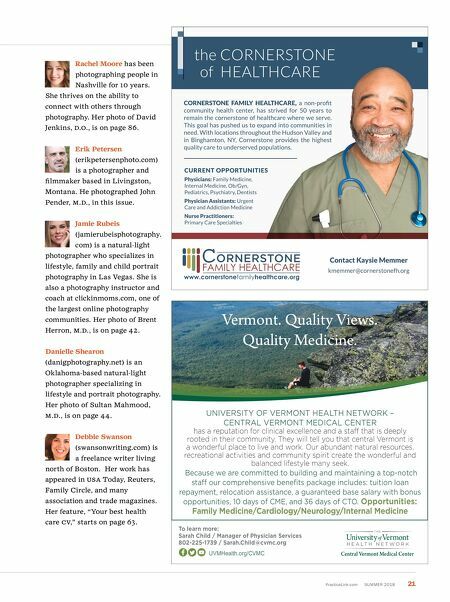 With locations throughout the Hudson Valley and in Binghamton, NY, Cornerstone provides the highest quality care to underserved populations. Contact Kaysie Memmer kmemmer@cornerstonefh.org CURRENT OPPORTUNITIES Physicians: Family Medicine, Internal Medicine, Ob/Gyn, Pediatrics, Psychiatry, Dentists Physician Assistants: Urgent Care and Addiction Medicine Nurse Practitioners: Primary Care Specialties the CORNERSTONE of HEALTHCARE UNIVERSITY OF VERMONT HEALTH NETWORK – CENTRAL VERMONT MEDICAL CENTER has a reputation for clinical excellence and a staff that is deeply rooted in their community. They will tell you that central Vermont is a wonderful place to live and work. Our abundant natural resources, recreational activities and community spirit create the wonderful and balanced lifestyle many seek. Because we are committed to building and maintaining a top-notch staff our comprehensive benefits package includes: tuition loan repayment, relocation assistance, a guaranteed base salary with bonus opportunities, 10 days of CME, and 36 days of CTO. Opportunities: Family Medicine/Cardiology/Neurology/Internal Medicine To learn more: Sarah Child / Manager of Physician Services 802-225-1739 / Sarah.Child@cvmc.org UVMHealth.org/CVMC Vermont. Quality Views. Quality Medicine. Rachel Moore has been photographing people in Nashville for 10 years. She thrives on the ability to connect with others through photography. Her photo of David Jenkins, D. o ., is on page 86. Erik Petersen (erikpetersenphoto.com) is a photographer and filmmaker based in Livingston, Montana. He photographed John Pender, M.D., in this issue. Jamie Rubeis (jamierubeisphotography. com) is a natural-light photographer who specializes in lifestyle, family and child portrait photography in Las Vegas. She is also a photography instructor and coach at clickinmoms.com, one of the largest online photography communities. 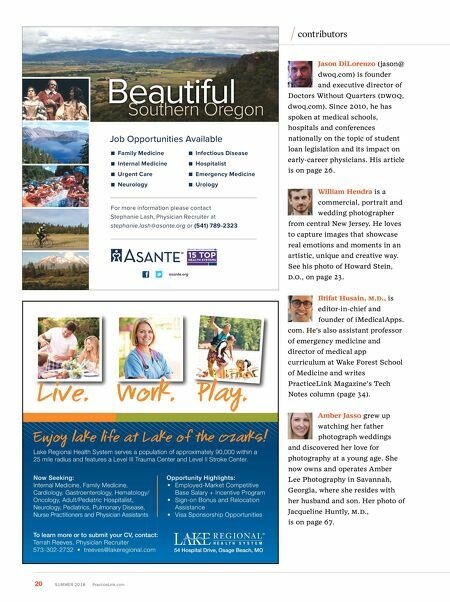 Her photo of Brent Herron, M.D., is on page 42. Danielle Shearon (danigphotography.net) is an Oklahoma-based natural-light photographer specializing in lifestyle and portrait photography. Her photo of Sultan Mahmood, M.D., is on page 44. Debbie Swanson (swansonwriting.com) is a freelance writer living north of Boston. Her work has appeared in u SA Today, Reuters, Family Circle, and many association and trade magazines. Her feature, "Your best health care C v ," starts on page 63.